The Ecofiscal Commission of Canada issued a report which Friends of Science Society says is deeply flawed in their new rebuttal – “Just the Facts on Carbon Tax.” Carbon taxes face growing unpopularity around the world with the biggest mass confrontations occurring in France, as the “Gilets Jaunes” or “Yellow Vests” persist in mass weekend demonstrations, despite police state tactics to stop them. Economists love carbon taxation because it is a market-based policy instrument... in their minds, more “economically efficient” than regulations and subsidy programs. They forget that such taxes are rarely alternatives to regulations and subsidies – they just become redundant add-ons. As carbon tax unpopularity grows in Canada, becoming a major political and personal issue, Friends of Science Society has issued “Just the Facts on Carbon Tax” rebutting a recent Ecofiscal Commission report that attempted to pacify objections, as reported by Macleans’, on March 29, 2019. 2. There is no open debate on carbon taxes and climate policy. Canadian media does not support Freedom of Speech and Freedom of the Press on climate change. 3. Extreme weather is unrelated to human influence on climate or carbon dioxide concentrations. 4. Carbon tax is not effective in reducing carbon dioxide/GHG emissions. 5. Carbon taxes hurt jobs and drive commerce and industry out-of-business or offshore. In 2013, the EU industry minister said such energy policies were causing an ‘industrial massacre’. 7. Canada one of the largest emitters? Faulty logic. Where is the climate justice for the world’s second largest, cold, vast, resource exporting nation? 8. Elites versus the People – tax-free/tax-exempt/tax-avoiding pension funds, sovereign wealth funds and union funds see you as their ATM for unfunded pension liabilities. 9. Fair and Equal? Green billionaires have funded the climate ‘crisis’ campaign for their own vested interests. 11. A cash grab by government – with an alarming scope of income that could be larger than even income taxes! 12. Not science-based – Carbon dioxide is not a control knob that can fine tune climate. Lyman notes that to reach Canada’s proposed emissions reduction targets, energy prices would have to be so high that they would drive millions of people into bankruptcy and major businesses would move offshore. 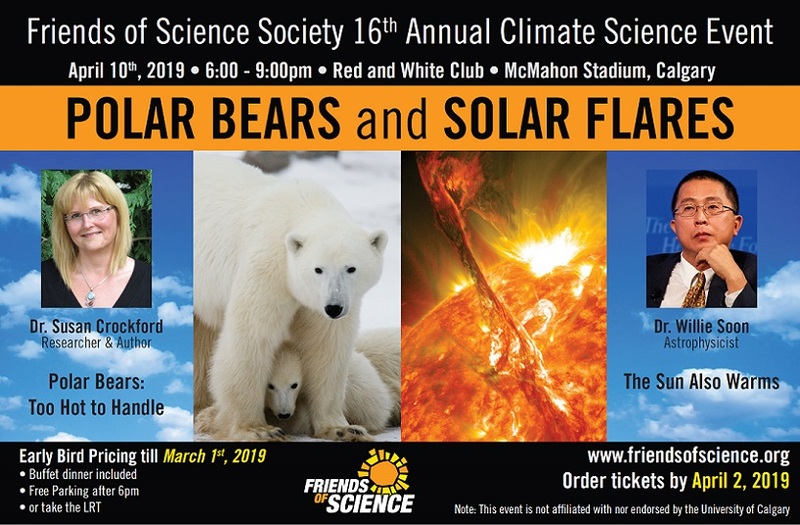 Claims of threatened polar bears will be debunked and special Canadian climate data on solar influences will be presented next week at Friends of Science sold out 16th Annual Event “Polar Bears and Solar Flares” – with guest speakers Dr. Susan Crockford and Dr. Willie Soon. 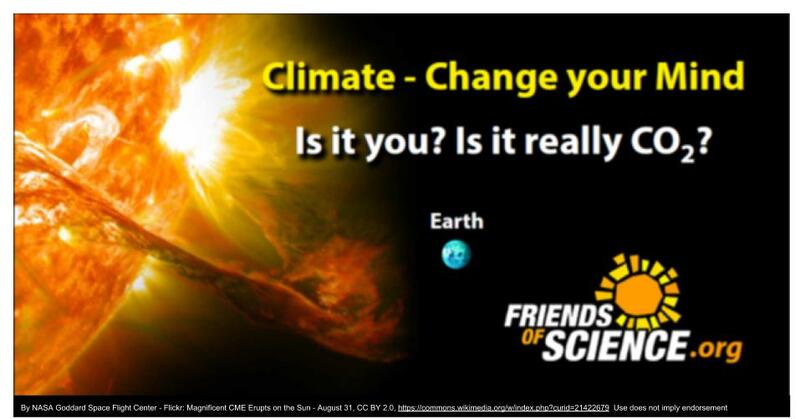 Friends of Science Society says the US is reviewing climate change science for data manipulation and overstatement of threats and Canada should, too. 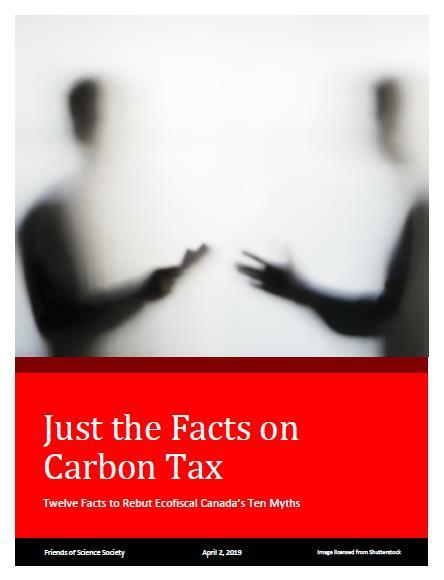 Just the Facts on Carbon TaxA rebuttal to Ecofiscal Commission of Canada Just the Facts on Carbon Tax - coverImage licensed from Shutterstock. Climate - Change Your MindIs it you? Is it really CO2?